Walter Vollrath's vintage racing debut could not have gone smoother. 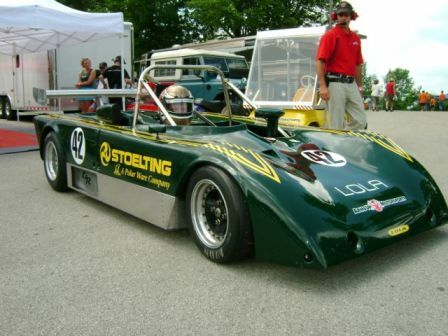 After a two-year refurbishing, the Elkhart Lake resident's 1978 Lola T497 ran the entire weekend without a problem. Vollrath, who has several miles around the Road America track, had not sat in the car until opening practice of the Kohler International Challenge. Gaining knowledge with the car each time on the track, Vollrath drove to a fifth-place finish in the 70's sports racer category at the prestigious KIC. After visiting the past, ArmsUp Motorsports returned to the Road America circuit this past weekend at the SCCA Cat National with four Formula Continentals and one Formula Atlantic. Revere Greist once again lead the Formula Continental charge with a third-place finish after a race-long battle for the second spot. Kirk Kindsfater, who had been fighting the stomach flu most of the weekend, drove to a well-deserved fourth-place finish. John Greist drove to a seventh-place finish after an electrical gremlin restricted his pace during the qualifying session. John Dickmann was forced wide in the Carousel early in the FC race but was able to recover to bring home an eleventh-place result in the number 60 EVScorvette.com car. ArmsUp Motorsports returns to Road America for the third consecutive week for the F2000 Championship Series. Making their F2000 pro series debut will be John and Revere Greist. The father-son duo will be joined by Skip Barber Veteran Rick Balsley. Balsley will make his ArmsUp debut as well as his first laps in a Formula Continental Car on the Thursday test day at the four-mile circuit.